Renegade Kid is sitting atop the PC edition of Mutant Mudds, ready to ship it out by the end of the month. To hype everyone up, here is a fresh trailer for your eye holes. As mentioned previously, the PC "Grannie Edition" will feature 20 additional levels, bumping the total level count up to 60. The trailer also gives you a glimpse of the depth-of-field effects that will replace the stereoscopic 3D from the 3DS version. 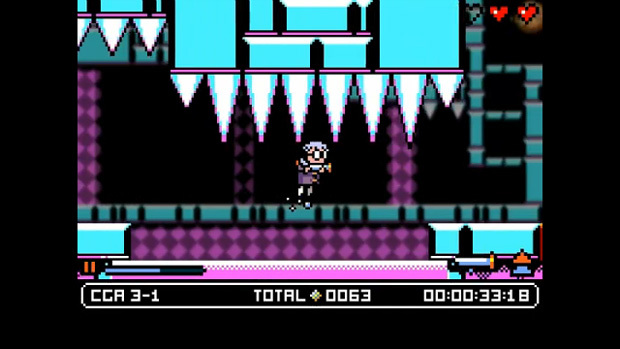 Also, you'll notice that the Game Boy- and Virtual Boy-themed bonus areas have been replaced by the more appropriate "CGA-Land," which mimics the color scheme of 80s PC software. Mutant Mudds will be available on August 30 through the Renegade Shop, GOG.com, GamersGate, and Desura for an introductory price of $7.99. After September 5, the price will bump up to $9.99.